GrowBiz has been providing community-based enterprise support in rural Perthshire since 2007. Based on an enterprise facilitation model, it provides a combination of one-to-one support, peer learning and support sessions, a mentoring programme and networking events – including three women’s enterprise groups – for anyone interested in becoming self-employed or developing a business. In just the past twelve months, GrowBiz has engaged with more than 400 individuals who were starting or growing businesses and social enterprises, and 70% of these were women. From operating originally in Eastern and Highland Perthshire, GrowBiz now works across rural Perth and Kinross, with help from LEADER funding. The GrowBiz approach to enterprise support is based on a ‘relational’ model, rather than a ‘transactional’ approach, building long-term relationships with the businesses and encouraging them to connect, collaborate and share with other enterprises in their local community, as well as networking further afield. Support is provided to anyone looking to start or expand an enterprise on a flexible basis, from pre-pre-start stage through to growth or diversification. 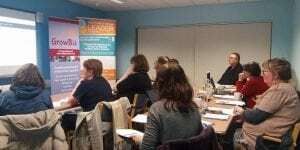 The monthly Women Enterprise Network (WEN) meetings are informal and friendly events for women who are starting up or who are thinking about starting up a business. With inspiring speakers and opportunities to meet a wide range of businesses, they regularly attract more than 30 enterprises. There are also regular peer support meetings for businesses in the creative services sector, mentors, tourism sector and for enterprise owners with health issues. GrowBiz will continue to develop its model of enterprise support and has an aim of supporting groups in other areas of Scotland who want to offer similar services. It will also continue to provide services in a non-judgemental, flexible and responsive way – encouraging anyone who is interested in enterprise in rural areas to connect and collaborate. GrowBiz receives support from LEADER, the Scottish Government, Scottish Enterprise, Perth and Kinross Council, SSE and RBS Skills and Opportunities. GrowBiz is going from strength to strength, supporting and connecting a wide range of local enterprises in sectors including tourism, technology, creative services and food and drink and with increasing demand for its services. In addition to continuing its regular face-to-face support and events, it is developing an innovative programme of online peer learning and networking events and is also creating digital toolkits to help other areas to develop a similar model. As well as peer learning and mentoring facilitators, GrowBiz also contracts with eight part-time enterprise facilitators/advisers with different skills and backgrounds – all self-employed. GrowBiz has developed and supported the unique Care and Wellbeing Cooperative based in Highland Perthshire. This is an umbrella organisation which has grown from its original nine members to a community of 32 micro-businesses and social enterprises – most of which are women – all involved in providing social care, health and wellbeing services to the local community. This is an increasingly important growth sector which needs innovative and creative solutions in rural areas, due to critical demographic changes and pressure on the statutory health and social care services. The Cooperative is now recognised as a ‘good practice’ model for other areas of Scotland and beyond and a Creative Care project, based on the success of the Cooperative, is also being delivered across Perthshire – raising awareness and creating opportunities for new enterprises in the care and wellbeing sectors. All of our events are free to attend and anyone is welcome to come along, regardless of whether you or your business are based in Perthshire, you are currently running a business or just thinking about setting one up. Our next Women’s Enterprise meeting, on 15 August 2018 is a joint meeting of the Strathearn, Eastern and Highland Perthshire networks in a Dragonfly Yurt (http://www.dragonfly-yurts.co.uk) at Railway Farm, Logierait, with our guest speaker Lynn Mann of Supernature Oils (https://www.supernature.uk.com/).